I have faced mounting hair care costs – the amount of money spent on maintaining my hair regimen was growing increasingly unaffordable. An 8 ounce bottle of the typical moisturizer in my neighborhood was running about $26 (not including taxes), not to mention the product running out in about 8 weeks (at best), and usually taking its time to penetrate my low porosity hair when I used it. I decided to shop around to see if I could find a product more suited to my budget that delivers a soft hair feeling while allowing my hair to look (and be) as healthy as possible. I was able to lay my hands on two products: “Cantu Shea Butter for Natural Hair Moisturizing Curl Activator Cream” ($9 – 13 ounces) and “Cantu Shea Butter for Natural Hair Creamy Hair Lotion” ($9- 13 ounces). Now I know that Cantu Shea Butter isn’t exactly a new brand, but I never really liked the use of certain ingredients in its moisturizers. My specific qualm came with the mineral oil and propylene glycol mounted very conspicuously at the top of a number of their product’s ingredients’ lists indicating these ingredients’ heavy concentrations, ability to weigh my hair down, and potential negative health effects. But I was really happy to find out that Cantu Shea butter reinvented their product line to introduce moisturizers that do not include mineral oil, sulfates, parabens, propylene glycol, silicones, phthaltates, gluten, paraffin, PABA or DEA! So I decided to buy both the Curl Activator and the Lotion, give my hair a good wash with a cleansing shampoo, and try em both out. As mentioned before, both products state that they do not include harsh or heavy ingredients; this is advertised very proudly on the packaging. Both products indicate benefits as well – namely, defined, moisturized, and conditioned tresses, with lots of body, shine, smoothness, and volume. The lotion specifically states that it detangles and softens as well (though I would argue that both products are effective at doing these things). Both the lotion and the cream deliver. 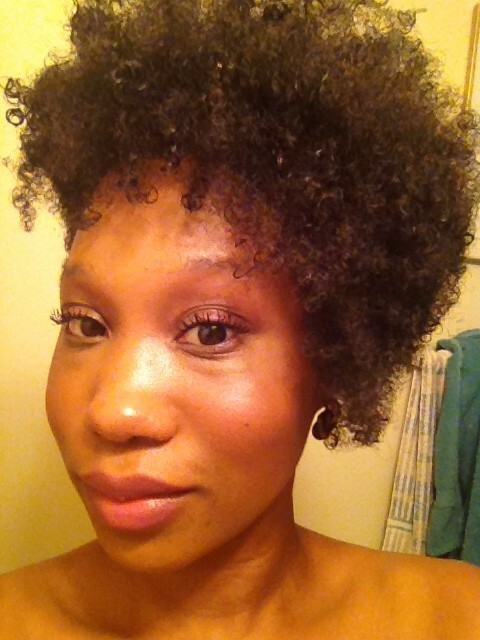 I used the lotion as a base/leave-in and the curl activator to style. My hair is not only soft but has a really nice sheen/shine to it. The curl definition is wonderful; the cream definitely works to define your hair as a styling aid as evidenced by the really nice twist out I got and the ability to use the cream to define my strands and give a wonderful textured look. The scent is noticeable, but not overpowering.Also – the moisturizing power is indeed legit(care of the numerous oils,and water as the number one ingredient). The need to moisturize my hair every other day has become virtually non-existent. I’ve been able to go 3 days without re-moisturizing – this level of moisture retention was unheard of before in my life before I tried this product. Seriously. And both have good “slip” – this is particularly evident with the cream. 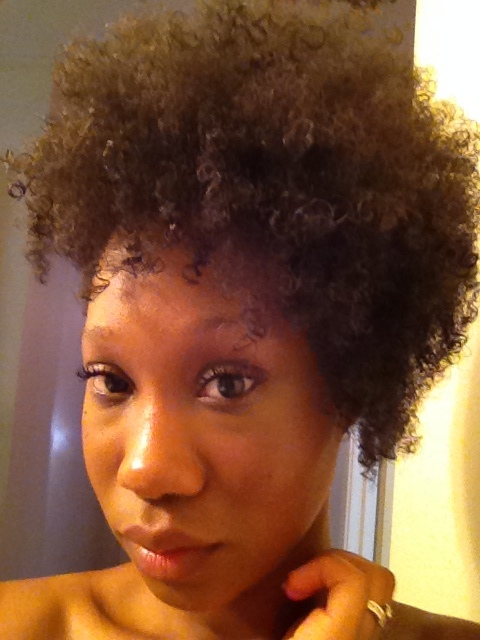 Freshly washed and dried hair; no product added. Cantu Shea Butter application and results! Now on to the cons, unfortunately. With all of the products’ benefits, there are some drawbacks — mainly in the ingredients used (ironically). Both products use Ethylhexylglycerin(www.ewg.org/skindeep) as a substitute to the use of parabens. Ethylhexylglycerin has been documented to cause skin irritation and is a relatively new chemical used in hair care products. Both moisturizers also use Phenoxyethanol (www.ewg.org/skindeep). This chemical is argued to be a toxic hazard that can have adverse effects on the good ole immune system. Sigh. The only silver lining (if any) is that both ingredients are the *last two* in both moisturizers’ lists of thirty ingredients, indicating the limited percentage of both ingredients in each product in comparison to the other ingredients in each list. However, both Ethylhexylglycerin and Phenoxyethanol are not the only unnatural ingredients in both products. These two are preceded by their lovely friends Polyquaternium-11 and Stearalkonium Chloride (http://www.truthinaging.com) (these ingredients are also argued to be toxic when used in particular doses). All things considered, I’ve made some conclusions and have thought about the use of these two products made by Cantu Shea Butter. At the end of the day, my hair helps me to make some final decisions. I’d like to go with whatever she (my hair) says while being responsible enough to keep in mind the potential side effects of ingredients. My hair type (for the sake of comparison and categorization) is 4B predominantly with sections of 4A, and “Z”,”S”, “L” types – strands that I simply can’t identify for the life of me. Currently, my hair is very defined, moisturized, and extremely soft – I have not experienced my hair feeling this way before. Ever. Yet, once the buzz wears off, I may reconsider the ingredient content and weigh the positive opportunities with potential negative outcomes. For now, I’ll enjoy the softness, suppleness, and definition my hair is experiencing, while mulling over the longer than usual ingredient names and their potential negative side effects to my health.